In November, the City of Loveland Art in Public Places program celebrated 30 years of public art! In 1985 Loveland became the first city in Colorado to enact an ordinance which earmarks 1% of all capital projects over $50,000 for public art. (It should be noted that this program is now used as a model for public art programs across the United States.) Art in Public Places (AIPP) was added to the Loveland Museum’s responsibilities and the Visuals Arts Commission was formed. The first two pieces of sculpture are installed into the newly created Benson Sculpture Park. Warrior/Wind Song by George Walbye and A Friend Indeed by Dan Ostermiller are purchased with proceeds from the first Sculpture in the Park show the previous year. Winning the Iron Shirt by Fritz White is donated to the City of Loveland Art in Public Places program and is installed at the North entry on highway 287. Susan P. Ison, Director of Cultural Services, receives the Governor’s Award for Excellence in the Arts. Sculpture in the Park celebrates its 10th anniversary. 38 sculptures now grace Benson Sculpture Park. The monumental sculpture, The Water Carriers by artist Herb Mignery, is installed at the Loveland Visitor’s Center. 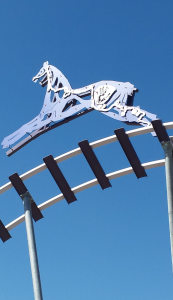 The sculpture was a collaborative effort between the Loveland High Plains Art Council (which oversees the Sculpture in the Park show) and the City of Loveland Visual Arts Commission. 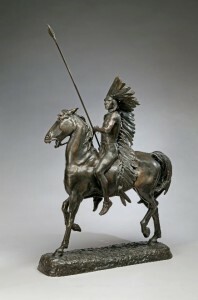 The Art in Public Places program contains 305 pieces of art in its collection with an estimated value of $7.5 million. To date, seventy-three percent of the collection has been donated to the City of Loveland. The Art Advocacy Project (TAAP) and Transformations projects are introduced to allow artists to showcase their work on the streets of Loveland. Equinox by artists Doug Erion, Doug Rutledge, and Jack Kreutzer is installed at the intersection of Highway 34 and I-25. This project incorporated a month’s long public outreach program at the Loveland Museum/Gallery. The artwork in the Foundations collection debuts in an exhibit at the Loveland Museum/Gallery. Art in Public Places celebrates 30 years. Five additional pieces are installed in Benson Sculpture Park bringing the total to 148. The City’s complete collection now includes 465 sculpture and 2 D Pieces!